Thank you so much for all your wonderful support. Some of you have been supporting our school for years and we are so grateful. In this report I'm going to talk about our blind children, even though strictly speaking they are now resident at our school. 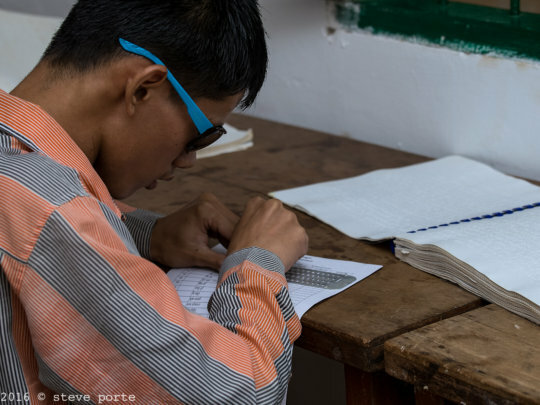 Being blind is difficult for any human being anywhere in this world, but in some countries such as Cambodia, blind people do not receive any help from the state at all. 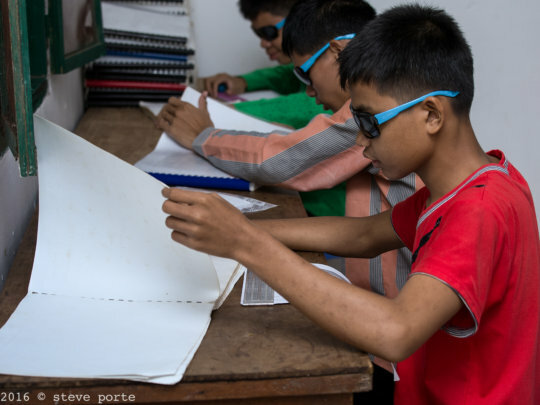 Children who are blind in Cambodia, too often have no future and are destined to be illiterate and to beg in poverty. Many from rural areas are considered shameful and a weight on their families. Children suffer from the most awful things being said to them and sometimes done to them. Who can imagine the humiliation and even sense of guilt they must feel at being told they are "useless". At our school we care for several blind children, including one blind and almost completely deaf boy, who has now been given a hearing-aid by the NGO "All Ears". We provide them with accomodation, full-time care, food, clothing and medicine, but importantly we also give them the tools to create a better life and a more secure future. We hire a Cambodian Braille teacher. The Khmer (Cambodian) language was only very recently transformed into Braille by the great efforts of Krousar Thmey. This NGO then trained Braille teachers to go out and teach at state schools. The only problem is that the state doesn't support them properly and they cannot be expected to work for free! Our school sponsors the cost of a Braille teacher to be with our blind children during their lessons. She supports them at state school and helps them transmit what they have heard into Braille text. The children also use special abacus beads and other materials to help calculate numbers, weights and measures for their maths class. They take part in national exams just as the rest of other young sighted students do. We also teach them English language and then computer skills in Khmer language. 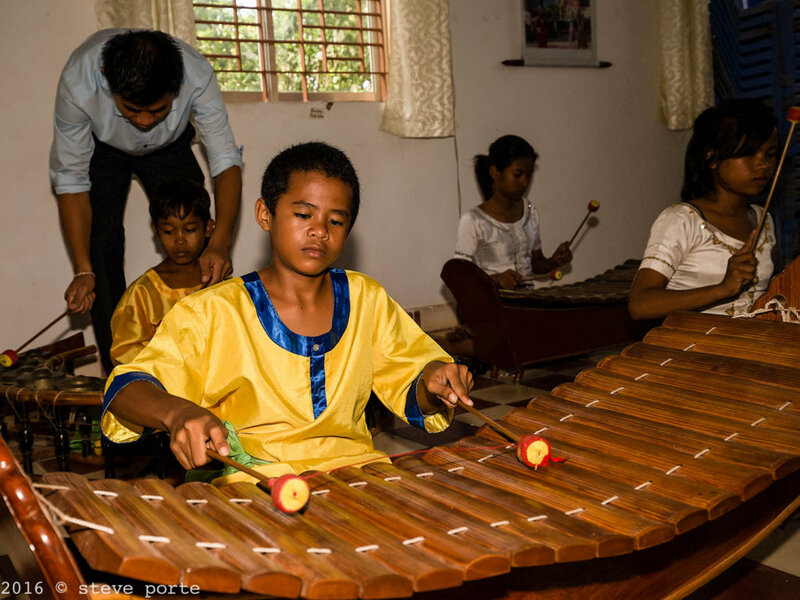 Together with their music studies, this gives them a more all-round, complete education, helping prepare them for proper job skills when they eventually graduate from our school. When I think about how much progress has been made. Last year one of our students Thai performed as a singer with our Pin Peat teacher in Thailand on the occasion of HRH Princess Sirindihorn's birthday and at the Conference Art For All. We were invited to do so by both the Thai and Cambodian Ministries of Culture. Since then our blind students have performed for important festivals and even in front of the American and British Ambassadors. Here is the link to donate....but hurry, only a few days left now until the appeal ends. Thank you from us all at our school in Kampot for your kind thoughts and important help. I would like to thank you all for your kind support and especially to those who so generously donate to our school every month! In this report I would like to bring your attention to our education project for our resident blind children. As you might know, blind children do not receive any support whatsoever from the state. 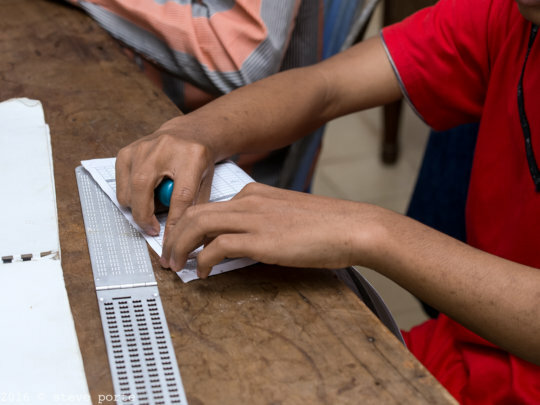 The majority of Cambodia's population lives in rural areas, where there are no NGOs assisting the blind and where there is absolutely no access to to state education because there are no Braille teachers. There are actually very few NGOs assisting blind children in Cambodia and our school is currently the one one in Kampot and the whole of Southwestern Cambodia. Many children who are blind are considered a blight to their families and to society and so they are rejected and marginalised, insulted and sometimes abused and forced into begging. We provide them with accomodation at our school, accompany them to their state school lessons, pay for their Braille teacher and provide vocational and therapeutic training in traditional Cambodian music - Pin Peat, Mohori and Yike. They also study English language and computer skills in the Khmer language. We are now running a micro-project on Global Giving to specifically sponsor their Braille teacher at a cost of $1500 per academic year. We have only 30 days left to raise these funds and so far we have raised $150. If you would like to be a part of supporting our blind children's scholastic education program, please join us on the Global Giving micro-project "Help our blind children get an Education, Cambodia". Project number 27416. You can also find the direct link on our Facebook page. Thank you all for your kind attention and valuable support! Thank you so much for your kind and important support. We appreciate it so much. We have been making important changes to our free arts training program and we would like you to know what we have changed and why. As you know we were providing free arts training to hundreds of children and teenagers from local state schools, in particular the Di Pok state school and Samdech Ta' school. 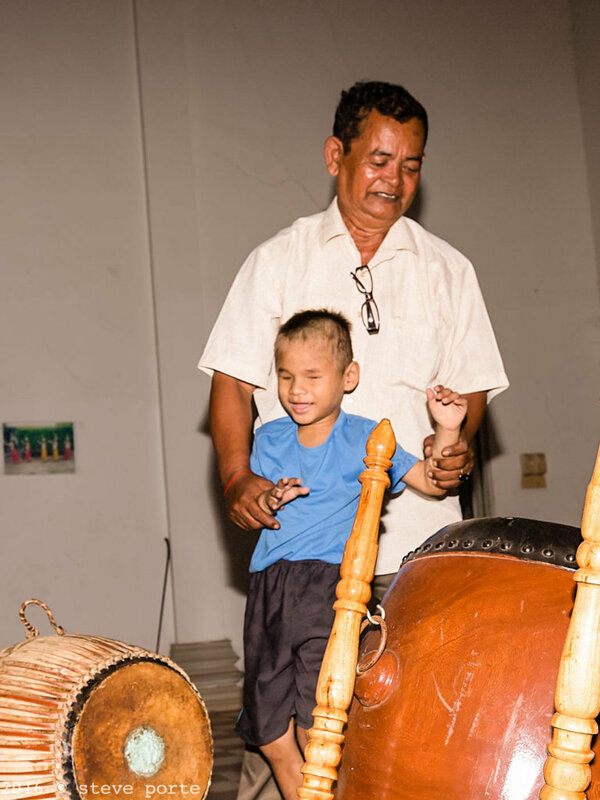 This was part of a program requested by the Ministries of Education and Culture to teach as many young Cambodians as possible about their traditional culture. This is considered an important area for conservation, because of the loss and damage done to cultural heritage during the Khmer Rouge genocide between 1975-79. Our teaching staff dedicated hours each week for several years teaching local school children traditional music, Yike and dance. However our staff decided that this program was not working well and not bringing the right results. Because the students were given to us without taking into consideration their capacities. So we had many students who were not talented and therefore quite bored with studying, not because they didn't like the arts, but because they couldn't really improve as they didn't have the talent necessary. Some of the wealthy students were even quite naughty and more interested in their cellphones. Our teachers, some of whom survived the genocide are quite old and found these kinds of lessons exhausting and fruitless. We concluded that although we had helped reach out to many children in Kampot and had given a generation of young people knowledge about their cultural heritage, we were not really preserving traditional culture which is one of our vision and mission elements and we were not able to concentrate on those children who really wanted to learn and who were often from poorer backgrounds. We went back to the beginning. We went back to our original Outreach program of helping poor and disadvantaged children from local villages who demonstrated talent and a true desire to learn. You may be wondering why not reaching out to hundreds of students and only teaching around one hundred / one hundred and fifty students would be considered preserving traditional culture...... This is because traditional Cambodian arts have been passed down orally from master to pupil for the last one thousand years. They were not written down and only now attempts have made to record music and dance for future generations. 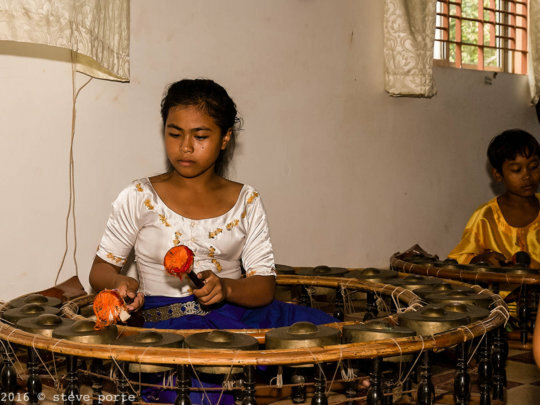 Cambodian music has survived for example because it was used in Pagodas for traditional Buddhist ceremonies, for classical dance, for weddings and for funerals. Musicians (except for the Chapey players) work in ensembles and perform for these ceremonies. It is a living art and is preserved for future generations when young Cambodians learn how to play instruments properly to a professional level. The same applies to the Yike and traditional dance. Today we are teaching really poor children and adolescents, some with disabilities. All love their lessons, work hard and have the capacity to become tomorrow's professional artists. Many of them come from families affected by alcoholism and gambling addictions and the arts for them is the only way out of poverty and destitution. We will be changing the title of our project soon and updating our information, but we wanted to share the changes with you first.